Each week the CFTC publishes what they call Commitments of Traders. It basically shows the volumes of open futures positions by asset class. Even though the futures market represents only a fraction of the overall FX volume (most FX volume is OTC), it gives one a good window into what FX traders (particularly small- to medium-sized players as well as retail traders) are doing. The latest CFTC report shows an extraordinarily high net long US dollar open interest in the futures markets. 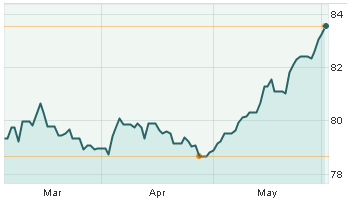 As one would expect this resulted in a tremendous rally in USD against major currencies in May (some 5% run-up). 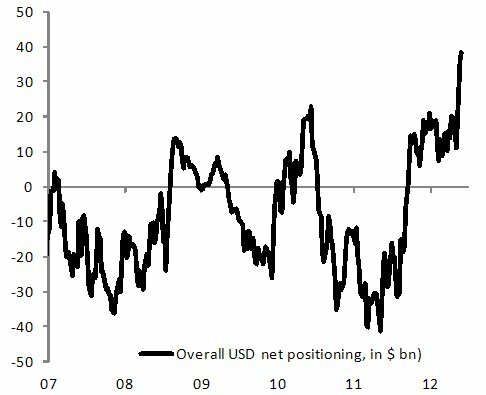 But such a historically high long USD positioning in the futures markets is starting to increasingly look like a "crowded trade". That makes the dollar quite vulnerable to a downside correction. Any hint of incremental monetary easing by the Fed that involves balance sheet expansion could force a violent reversal (such action could be adding to the dollar supply). Ironically a material action by the ECB or even the PBoC could do the same by making "risk assets" more appealing. Long the US dollar is clearly a good position to be in from a fundamental perspective given the global slowdown, but the technicals from the CFTC report tell us otherwise. Other technical indicators may be pointing to the US dollar being overbought as well. This is particularly true given a rapid increase recently of retail currency traders who are known to pile into the same trade (usually late in the game) and then panic. WSJ: - Foreign-exchange brokers that handle the lion's share of retail trades—known in the industry as "retail aggregators"—accounted for 18% of volume in the $4-trillion-a-day currency market, compared with 10% in 2010, according to the latest annual survey by consultancy Greenwich Associates.